A Queen Anne Formal Living Room got a stunning makeover to take advantage of the amazing Space Needle views. Our discerning client loves statement pieces and mixing styles which is a Joy Home Interiors specialty, so this was truly a project where we played with styles, textures, patterns, materials, metals, shapes and scale resulting in a glamorous and unique formal living space. This room also needed to be Kid, Cat and Red Wine spilling friendly. Challenge accepted and mission accomplished! Joy Home Interiors created a richly layered sophisticated design resulting in a room oozing style that our clients aren’t afraid to live in. Photos by Wynne H Earle Photography. 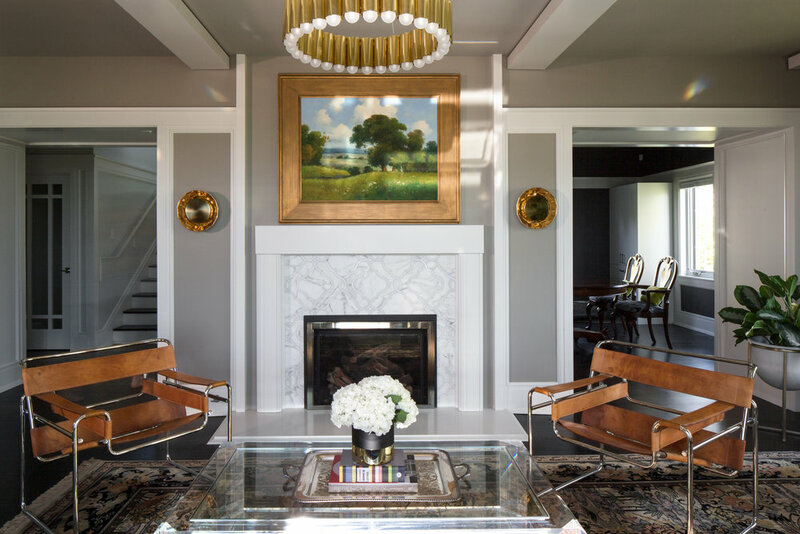 This professional couple with two labradors wanted to make their newly-purchased Madison Park house an expression of their contemporary style, filled with warmth and personality whilst creating a calming vibe. They wanted curated pieces that would hold up to their dogs. 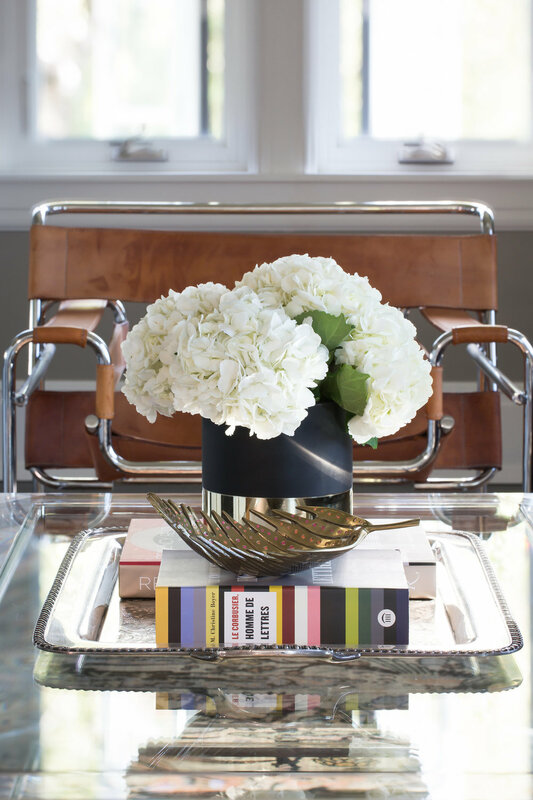 That’s where Joy Home Interiors came in and created a design taking them from sleek contemporary to warm and modern using pattern, textural elements, and color. The amazing architecture was perfect to showcase beautiful original artwork by local artists. Joy Home Interiors created a space that reflects the warmth of our clients whilst providing them a sense of zen from their busy lives. Photos by Wynne H Earle Photography. A couple approached Joy Home Interiors to help them design their living room in their new home. We had 2 challenges with an awkward floor plan and the couple having differing styles. With the long and skinny floor plan we decided to create 2 separate living areas within the open plan room. On the style front, the couple trusted our design ability to combine their styles into a Modern Rustic Mash Up. We were able to achieve this by grounding the room with neutral toned modern sofas, and we added our rustic with the distressed wooden tables and antique bronze lighting. We created our zones by using 2 different color palettes in our styling and layering. The result is a well-lived in and stylish home designed for every member of the family, where memories are made daily. Photos by Wynne H Earle Photography. Three Seattle families purchased a vacation home in the Coastal town of Seabrook to continue their vacationing traditions and as a rental investment. The clients wanted to embrace their location without being too "beachy". We designed a calm and layered aesthetic with a mix of textures, materials and colors that would stand up to the six children of the owners and the renters that would create vacation memories. The home caters for large family living that connects spaces and nooks for all kinds of interaction during the summer breezy restful days and the cozy snuggly winter months. Joy Home Interiors created a laid back, simple and breezy environment for all ages and stages. A young family in Magnolia is wanting to capture their style and add more storage to their informal dining area. The area also needs to be stylish and safe for their busy 1 year old son. A Queen Anne Family Living Room is getting a new look. With an awkward floor plan we are giving this space the rejig it needs by removing a diagonal 80's fireplace and opening the room to create 2 seating zones for a busy family of 4. With an injection of eclectic glam this is going to a farmhouse with an edge! A retired couple are refreshing an eighties island home. With a small footprint, this house needs to efficiently designed to create a relaxed modern space for this couple, their grown up children & grand children.